Our next meeting will be on Wednesday 30th May, 7.30pm at the Cotteridge Church Centre, upstairs in the Chiltern Room.  Post election, the ‘ordinary’ campaigning has begun again, mainly around the forced academy issue in local primary schools. We have been involved in leafleting outside West Heath, Primrose and Northfield Manor Schools, the very successful public meeting in Northfield that made the front pages of the local press, and the great meeting last night in West Heath, called by the NUT and the NASUWT. The follow up meeting of Hands off West Heath School will be next Monday, 6.30pm in Oddingley Hall, complete with refreshments.  Our petitions for the Kings Norton and Stirchley Libraries need to be handed in, and the best opportunities will be at the next Kings Norton and Bournville ward committees. (Kings Norton on 7th June 7pm, and Bournville yet to be organised). If we can get a good delegation to both meetings, we can also raise leisure services, Stirchley regeneration, Weatheroak and possibly quite a bit more. The next meeting of the Northfield Ward committee is on Monday 18th June 7pm.  A prominent person in Cotteridge has told us said that she had spoken to several local people who had told her that they had read our election literature and were (almost!) inspired to vote for the first time in their lives. 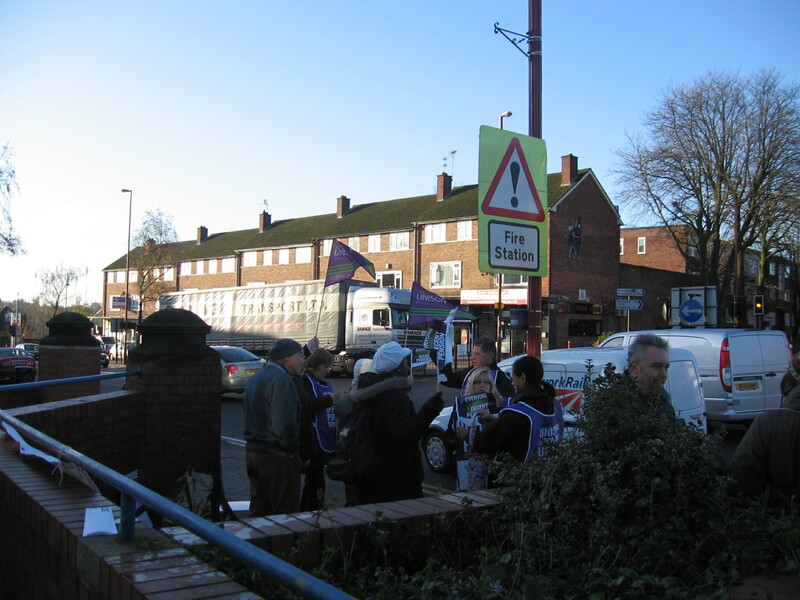 1) Protest outside Kings Norton Library. (against cutting opening hours from 5 days to 4) Meet at 5pm, Thursday March 8th. Pershore Road South (near the Green). We will go on to the ward committee at 7pm. 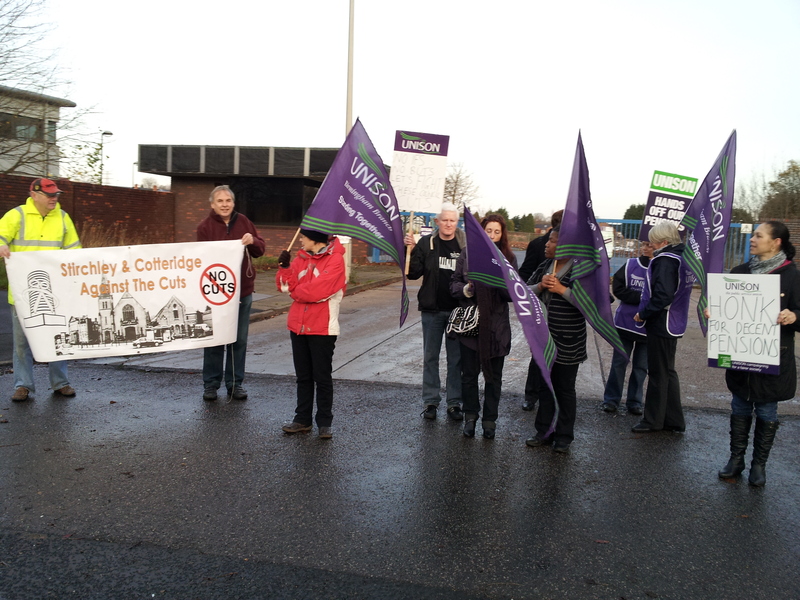 3) Protest outside Northfield Sports and Leisure Centre over its proposed privatisation. Saturday 10th March. 11am outside the baths. 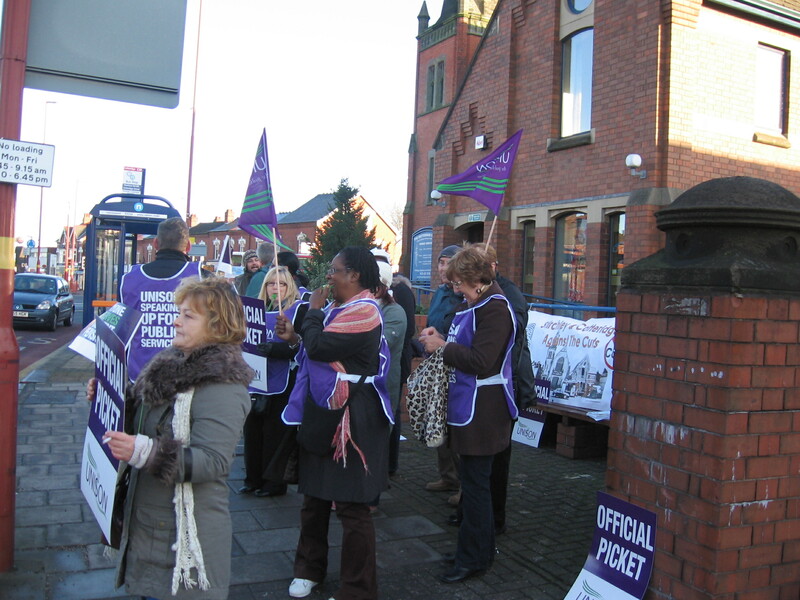 4) Protest outside Stirchley Library 15th March. We will update this post as full details of some of the activities are finalised, but please note the dates in your diaries now. You can get involved with this group by emailing them at StirchleyAntiCuts@Gmail.com, or by turning up to one of their events. · We were very pleased to have two parents from Charles House at our last meeting. They have a pledge from Councillor Les Lawrence that he will attend to meet parents next Friday at 12.30pm. The press will most likely be there. The next day, 10th December, there will be a street stall on Kings Norton Green, meet at 10.30am, where they also plan to visit the local Councillor’s surgery. · We had a first discussion about the problem of having three pro-cuts council candidates in Bournville and other local wards at the May elections. A representative from the Green Party attended and confirmed the offer of a no-cuts collaborative approach. Various views were put forward on this and it was agreed to re-discuss the issue at our next meeting and come to a decision. Despite being invited, a representative from the Labour Party did not attend. · We agreed to make a special free offer to Charles House parents for our upcoming social on December 15th. The updated flyer is attached. You will see that bar food will be available. · Our next meeting will be on Wednesday 14th December, venue to be confirmed. 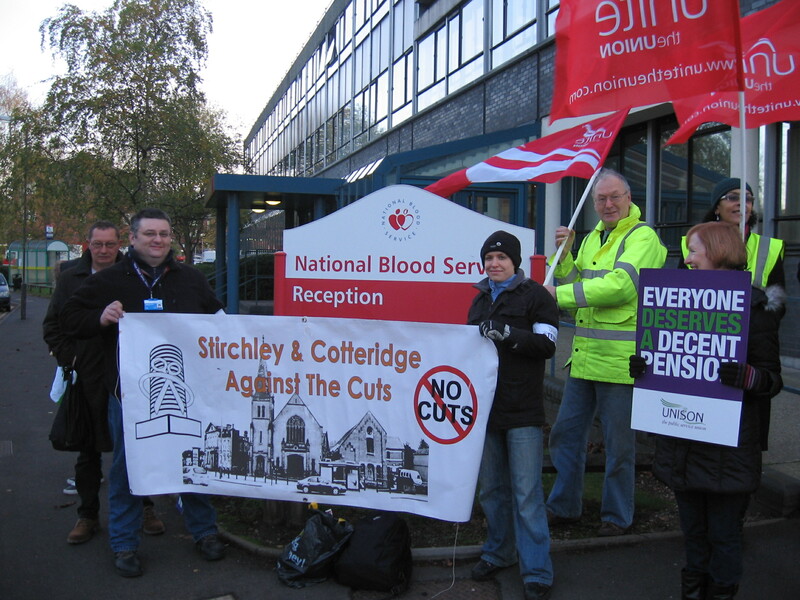 Stirchley and Cotteridge against the Cuts did a tour of the main picket lines in our area this morning; Lifford Refuse Depot, Lifford House, The Blood Service and the Cotteridge Church Centre, before joing the main march in town. At each location, there was a constant honking of horns to show support. There was barely any negativity from passers-by. 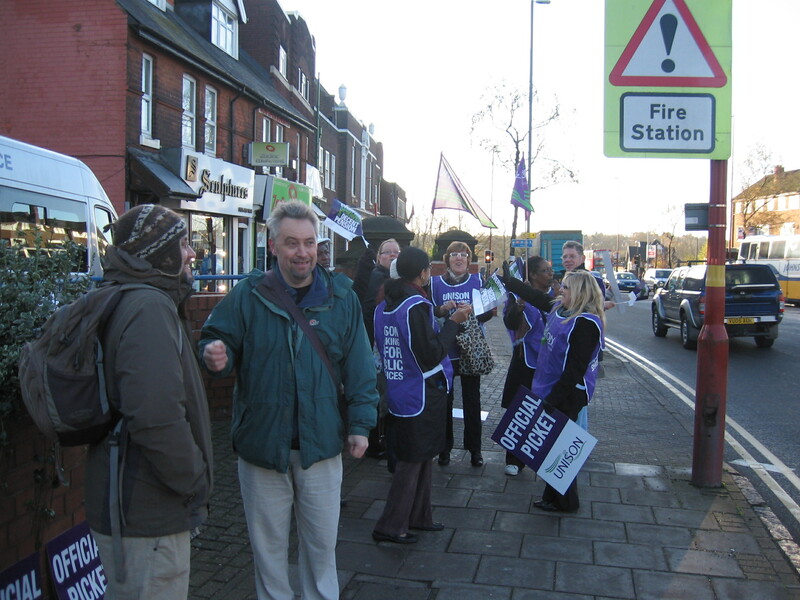 There was a good, confident and determined mood on the picket lines. We got the feeling that although the government is not crumbling just yet, our side is beginning to get its act together. The ConDems had better watch out. We will continue trying to unite workplace/union struggles with local public service and community issues; unity of service providers and consumers in struggle is the best way to end divisions fostered by the government, and is also the best way to win. 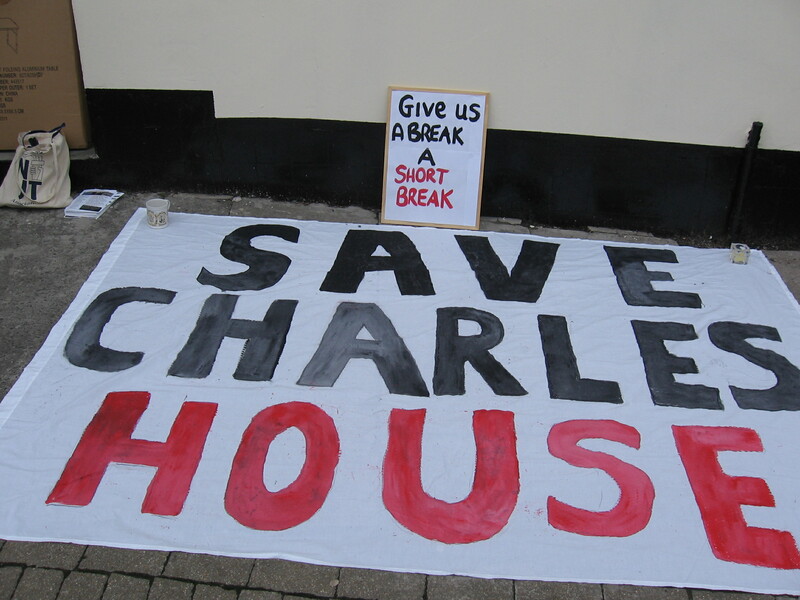 Our current focus is ensuring that Charles House stays open, but when any further union action comes up in future, we will be there as well. Activities agreed at last night’s planning meeting. Please help out where you can. 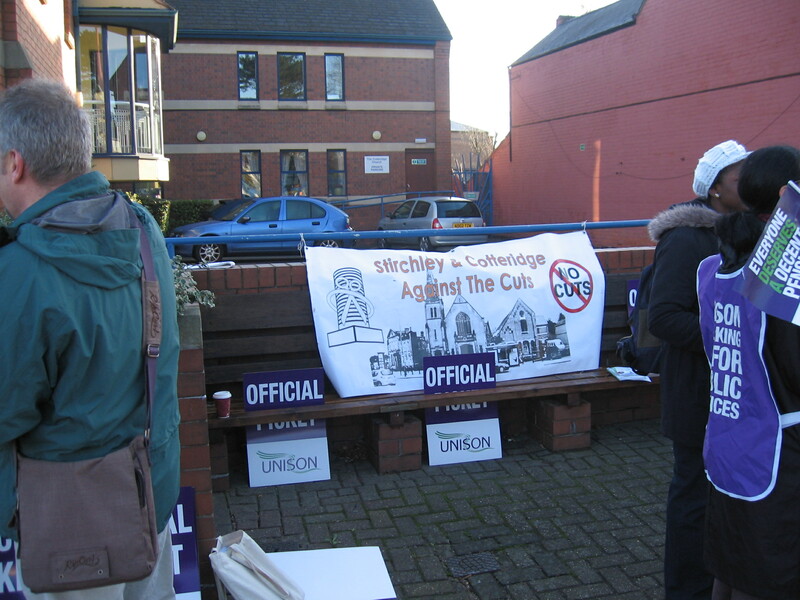 Sat 19th Nov; 12-2pm – Leafleting in town centre, outside Waterstones, near the Bull, alongside TUC day of action. 7am – probable picket at Lifford House, maybe picket at Lifford Refuse depot even earlier, probable pickets at Connexions – Northfield and other places. 9am – protest at Cotteridge Church Centre. Be there with our banner! 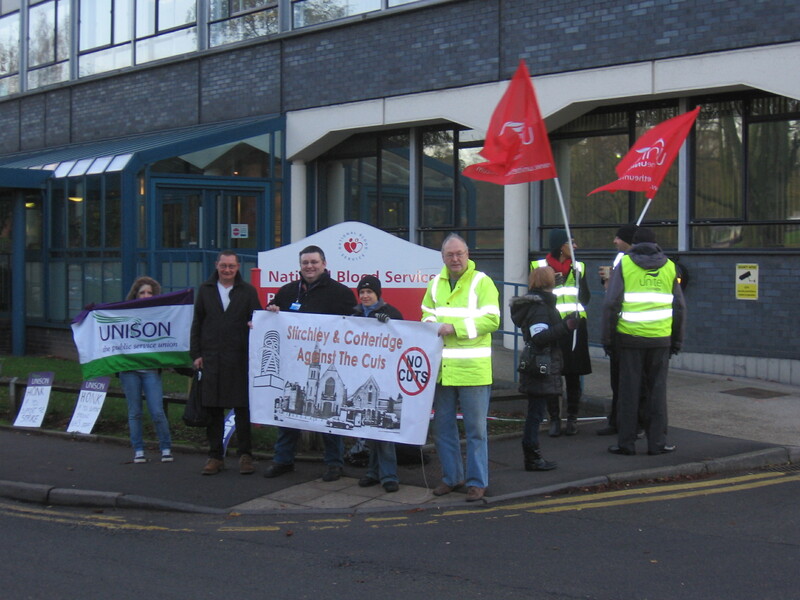 10am – Trade Union rally outside University main gates, opposite Fire Station. Fri 18th Nov; 5pm – lobby of Councillor Dawkins. Woodlands Park Rd. Monday 5th Dec; 7pm – lobby of Cllr Dow, Selly Park Tech College for Girls. Wed 23rd Nov; 7.30pm – Special meeting of SACAC. One item on agenda – Nov 30th! Cotteridge Church Centre. 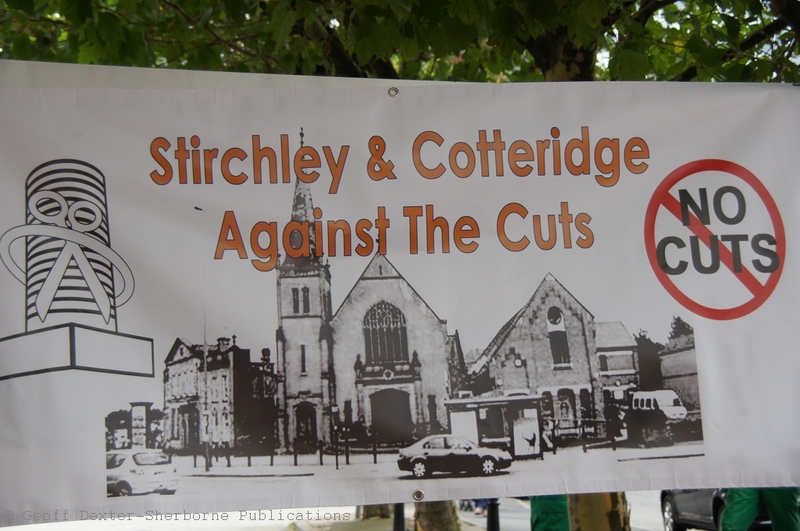 Stirchley and Cotteridge against the Cuts Social! 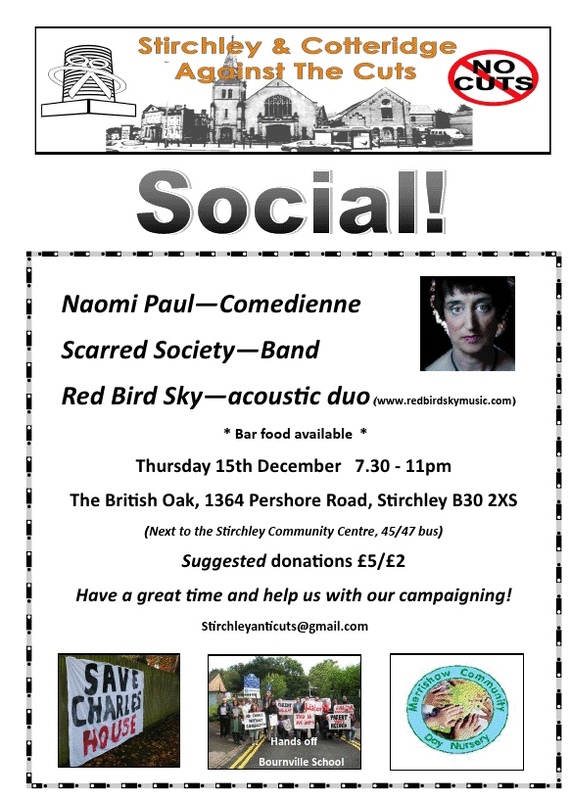 Thur 15th or Fri 16th Dec; at the British Oak, Stirchley, with Naomi Paul (Comedienne) and “No More Numbers” (GreenDay) band – to be confirmed. Any more talent amongst our supporters? KNHS voted to go with ARK. Maybe delay till next September. Debts paid off by BCC before conversion? No news of Hawkesley JI. West Heath JI?